The study was the first to train dogs to voluntarily enter an MRI scanner and remain motionless during scanning. 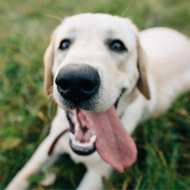 Researchers from Emory University, Atlanta, have revealed new insights into how dogs process human language. Writing in the journal Frontiers in Neuroscience, the scientists describe an experiment in which they used MRI to learn how dogs process words they have been taught to associate with objects. The team found that dogs have at least a limited neural representation of the meaning of words - differentiating words they have heard before from those they have not. In the study, 12 dogs of varying breeds were trained by their owners to retrieve two different objects based on their names. To make it easier for the dog to tell the difference, the objects were made of different materials (e.g one soft toy and one made of rubber). The dogs were trained to fetch one of the objects and then rewarded with food or praise. Training was complete when a dog showed that it could distinguish between the objects by continuously fetching the one requested by the owner when shown both of the objects. Next, the trained dog lay in an MRI scanner whilst its owner stood at the opening and said the names of the dog’s toys at set intervals. The owner then showed the dog the corresponding toys. One dog, for example, heard his owner say the words “piggy” or “monkey,” then his owner held up the corresponding toy. The owner then spoke gibberish words, like “bodmick” and “bobo,” and held up novel objects such as a doll or hat. Interestingly, the researchers found that the novel words caused greater activity in the auditory regions of the dog’s brain than the trained words. Researchers hypothesise that the dogs may show greater brain activity to a novel word because they sense their owners want them to understand what they are saying, and are trying to do so - perhaps in return for praise or food. The study was the first to train dogs to voluntarily enter an MRI scanner and remain motionless during scanning, without sedation or restraint. Increased activation for novel words was observed in 50 per cent of the dogs taking part in the experiment. This increased activity took place in the parietotemporal cortex - an area of the brain that is comparable to the angular gyrus in humans, where lexical differences are processed. The other half of dogs showed heightened activity to novel words in other brain regions, including the amygdala, caudate nucleus and the thalamus. Researchers said the differences could be linked to the limited size of the study and the varying range in breeds and sizes of dog.